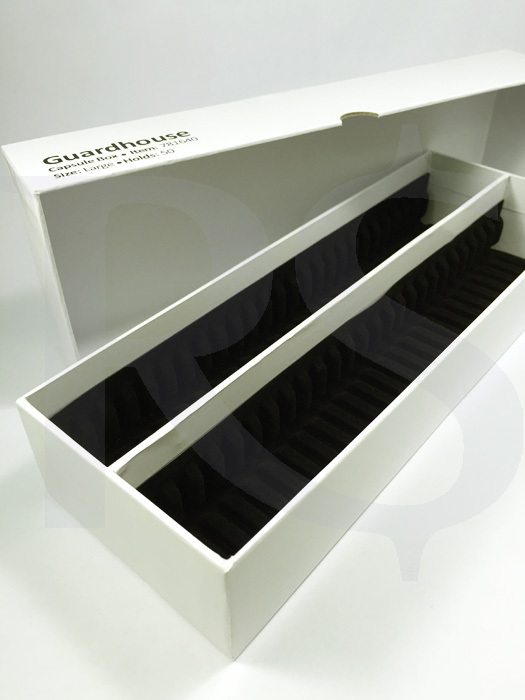 We are pleased to offer for sale this Guardhouse Double Row Glossy white chipboard box with velour flocked interior slots to snugly hold 50 Guardhouse coin capsules. Also works with Airtite size H and Coinsafe holders. Is ideal for Large Dollar, Silver rounds, and American Silver Eagle coins. Will also accommodate coin capsules with rubber rings measuring 26-32mm. The exterior measures approximately 11" x 4" x 2.25" when closed. Each order is for a box and lid, and is equipped with slots to keep the capsules in place. Guardhouse boxes are made of durable, strong chipboard with high quality, glossy white wrap. They are ideal for storing and organizing your collection of coins in capsules.